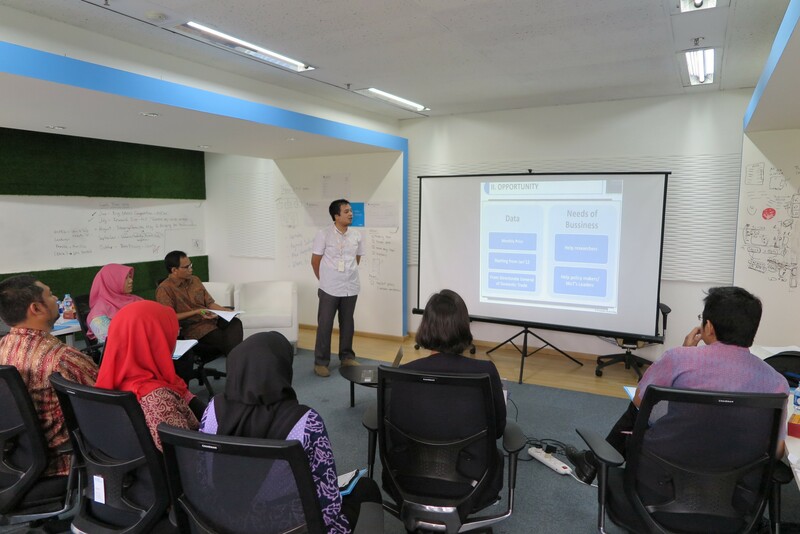 Pulse Lab Jakarta had the pleasure of hosting the Ministry of Trade’s Centre for Data and Information (Pusdatin) this morning for a pitching session. The Pusdatin team was presenting projects they have been working on in order to develop their internal systems and data products. PLJ has been collaborating with the Australia Indonesia Partnership for Economic Governance (AIPEG) and the Ministry of Trade’s Centre for Data and Information (Pusdatin), as the latter navigates an organisational change process to become more data-driven. AIPEG has provided a series of on-the-job capacity building initiatives, which has resulted in a number of small projects owned by the Pusdatin team, including the development of a data request case management system, activities to enhance data quality, improvement of data warehousing, data virtualisation and decision support analytics, as well as data visualisation and interactive monthly reports. 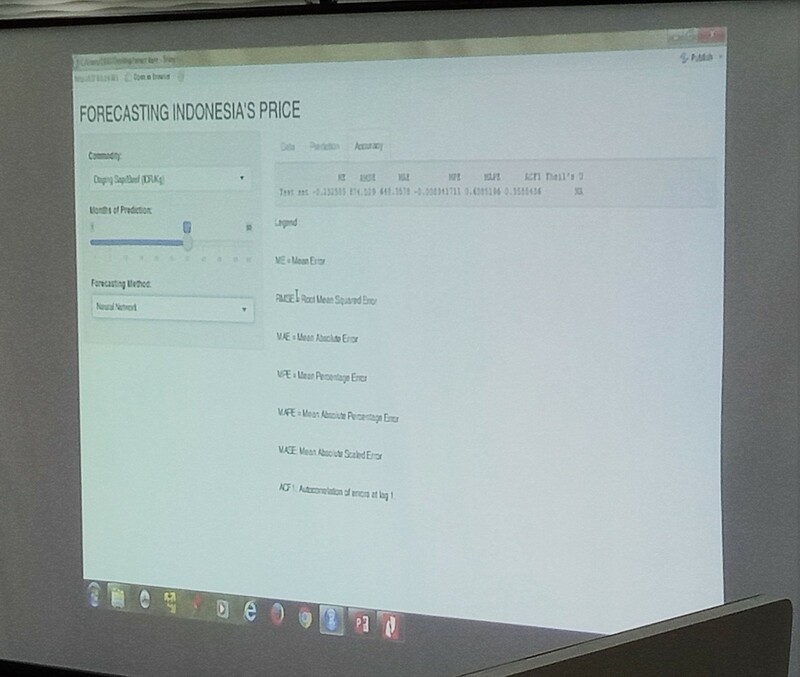 The Pusdatin team chose two of these prototypes — an automated platform for domestic commodities forecasting developed by Ahmad Sohibil Kahfi and an export data visualisation by Wahyu Budianto — to be peer-reviewed by their Pusdatin co-workers, colleagues from AIPEG, and our team of data geeks and designers. Kahfi’s platform automatically runs five different methods to forecast prices of major commodities, and provides the comparative levels of accuracy for these methods. These predictive models are currently based on historical price data alone, and some of the suggestions from the crowd were around inclusion of other variables such as weather patterns, periodic events, and export-import levels. The clean, easy-to-use platform itself was already pretty cool, though. 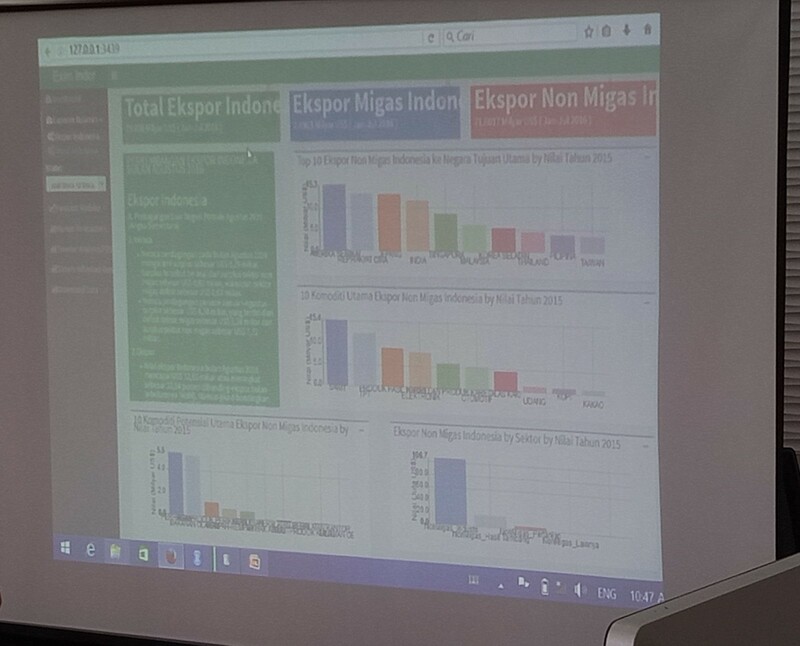 Wahyu’s export data visualisation platform came from the need to improve the way his team’s monthly reports are produced and presented. Currently, it takes up to eight people several hours to produce these reports, but Wahyu is hoping that his prototype can lower the resourcing requirements to visualise data for these reports down to one person and a click of a button. We were pretty impressed to hear that these guys learned R for two months, and have then independently managed to produce these prototypes. This bears testament to both the Pusdatin team’s technical potential, as well as the effectiveness of AIPEG’s on-the-job, highly applied capacity strengthening approach. Earlier in the year, the Pulse Lab crew worked with the Pusdatin team to develop a couple of data vis prototypes as a way to explore what’s possible with existing MoT datasets: one for mobile, the other for desktop. We also provided a data visualisation training for Ministry of Trade staff, in collaboration with the AIPEG team. What has been really great to observe over the past few months is how the Pusdatin team have developed their ideas and are producing useful and meaningful data products. It is so inspiring to connect with and support change-makers within the state administration. It is precisely this kind of leadership at the technical level that builds the systems, knowledge and capacity that ultimately enhances state effectiveness. This is the kind of collaboration that we are keen on exploring further, and this morning’s sharing session left our team abuzz with new ideas for data sense-making, for investigating new data sources for insights that can complement trade data, and on how we can work together to build a community of practice for trade data products across state agencies. Thanks for a great Friday morning, Pusdatin team and AIPEG!